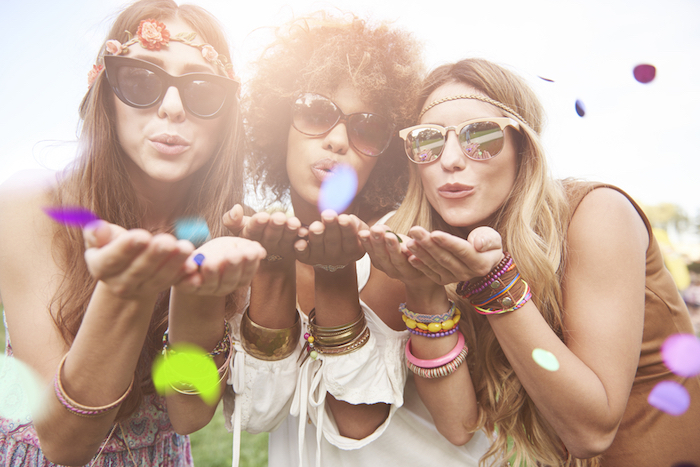 Snag your sunnies, slather on the SPF and bust out your best braids—festival season is officially upon us. The Coachella Valley Music and Arts Festival is kicking off this weekend (April 13-15), then continuing onto the next (April 20-22), for six days of sick sounds and major style moments. While you might be new to all the coolness of Coachella, the festival is actually a throwback. For nearly 20 years, hundreds of thousands of festival, music and fashion lovers alike have descended upon desert-set Coachella for good tunes, good vibes and—let's be real—a solid stack of pics to post on your Instagram feed now and for weeks to come. TBH, we *love* seeing everyone's inventive outfits, on-point makeup and awesome accessories on our feeds each year—so much inspo. But if you can't make the trek to Indio, Calif. to attend this year, you can still live the experience from the comfort of your home (and phone!) by creating your own Coachella-inspired staycation (sans sweaty crowds and sunburn, ofc). It's cinchy with these easy tips. FOMO? Definitely no! Get the festival vibes flowing by creating your own comfy camp. You can *literally* build a fort in your living room with blankets and pillows for max comfort. 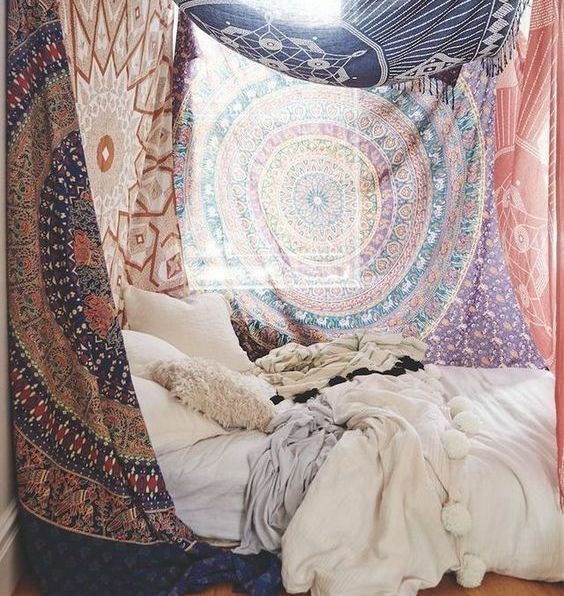 To make a more permanent, seasonal change to your space, snag a cute canopy for your bed (this one DIYed from tapestries is *so* cute) or pick up a few boho touches—we heart the new Opalhouse collection from Target—to make every day feel like Coachella. First and foremost, Coachella is all about the music. Cranking up *just* the right tunes will be crucial to your at-home festival. This year's headliners are The Weeknd, Beyoncé and Eminem, so you'll totally want their newest albums on repeat: My Dear Melancholy,, Lemonade and Revival, respectively. If those three aren't your absolute faves, there's plenty of other musicians coming out to jam this weekend and next. Grammy-nominated SZA has a soulful sound while Vance Joy and LANY are more indie pop. You can check out the full list of artists performing here, and then curate your perfect playlist! One of the best parts of Coachella is the crazy-fashionable outfits everyone pulls together. Whether you'll be hanging at home solo or in the park with friends, you absolutely need to dress the part. Ditch the yoga pants and pull out that flower crown you've been dying to wear, babe. It's time! Everything about this fest's fashion is bohemian and free-spirited, so show off your flower-child side with floral patterns and lightweight knit tops. A bright tee with a neutral, sleeveless cardigan and frayed denim bottoms is a fab start. Don't forget to accessorize, accessorize, accessorize! If flower crowns aren't your thing, rock a circular floppy hat. Grab a pair of grandpa frames or round sunnies and throw on as many rings and bangles as you can. Finalize the outfit with a layered choker to really bring it all together. If you need any more inspo, look no further than the Coachella queen herself: Vanessa Hudgens. Coachella serves up some seriously gourmet meals and uber cool drinks that you can *def* recreate right in your kitchen. For brekkie, look toward Backyard Bowls for inspo. Create an awesome açaí bowl with all the fixings, like coconut, chia and banana (get the recipe here), and blast C'hella tunes while you top your treat to make it feel like you're really there. For lunch, head over to your fave burger joint to match Cassell's Hamburgers. If meat isn't your thing, make your own vegan burritos with beans and lots of veggies, just like you're at Cena Vegan. When it hits dinnertime, order in some orange chicken from the Chinese restaurant down the street. You won't be having any FOMO from Fat Dragon! And if you need a quick pick-me-up, make your own latte or smoothie a la Joe and the Juice, which will be served at Coachella, too! There are four different superzoom settings: dramatic, beats, TV show and bounce, and each has its own unique effect music. The best subject for this feature? Your adorable pets! Press play on "I Fall Apart" by Post Malone and zoom in on your cat for all the LOLs. This is one of Insta's newest features and it *totally* changes the game. With focus lens, your photos will look like they were taken with a way expensive camera and lens, making it perf for your selfies. Get snapping! There's never a bad time to use GIFs. Because Coachella is so popular, the landing page of GIFs—aka the Trending page where the most-used GIFs live—will probably have a ton of festival-related stickers to try. Don't forget: You can also search almost anything, so there's no doubt you'll find the perfect sticker for your post. This is perf for when you're selecting your accessories for the day. Ask your followers if you should rock a floppy hat or a retro bandana. Or, let them weigh in on which headliner you should listen to while you're whipping up some brekkie. Make sure you post another pic to let them know which option you went with! Rope in your followers for a bit of Cardi B dance party. It'll feel like your own personal concert! Add "audience members" by going live with your friends. See the how-to above for more deets! How will you C'hella this weekend? Share your plans below!